This podcast covers two topics. First it covers the concept of a signature dish and shares with you how I make my Endless Summer Crostini. 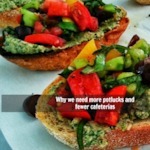 Second it covers how grades, rubrics, standards, and college admission requirements are forcing our students to create their learning in a cafeteria format, when instead we should be promoting the idea of a potluck experience.